The genius of supply and demand as economic theory is its raw, basic simplicity. There are plenty of other determinants with hands in the market, but if demand stays constant and there is a new, unprecedented rush of supply, it’s pretty clear why prices will subsequently plummet. This is exactly what’s happening as wholesale marijuana prices continue to drop. 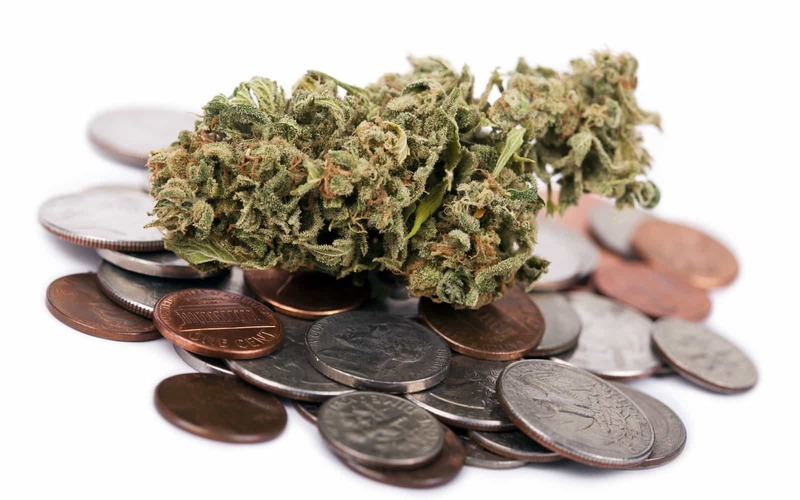 In many states where cannabis is legal, wholesale marijuana prices continue to drop, and there are simple economic explanations why. As more and more cannabis producers enter the market, with bigger and bigger cultivation facilities, this drop is entirely predictable. As Marijuana Business Daily reported on Monday, the average asking price for a pound of cannabis on Colorado’s wholesale marijuana market is currently at an all-time low of $1,298, down from a three-year high of $2,007 in January 2015. And all the factors driving down the price—more competition, more efficient production and even more competition—are still at play, meaning prices should plummet even further. When that happens, producers may be compelled to grow even more cannabis, flooding the market with even more supply, which will drive the price even lower. You get the idea. While it’s true that newcomers are entering the commercial marijuana market all over the country—in no small part because they believe that black market-era profit margins are theirs for the taking, and are presenting such rosy revenue projections to their investors—in Colorado’s case, it’s a situation of existing producers ramping up their output. According to Shon Williams, a consultant with Mjardin, a Denver-based group of cultivation advisers, big companies are able to add capacity without much in the way of increased cost. As a result, they can remain profitable even while accepting those lower prices. In Colorado, what newcomers there are tend to produce cannabis using the sun, a relatively new allowance in the state. Outdoor producers may not be able to fetch nearly as much per pound, but they’re able to produce that pound much more cheaply. That translates into a slightly smaller hill to climb toward profitability, whether or not the final product stays as flower or (more likely than not) is extracted into oil for edibles, concentrates or vape cartridges. This does make newcomers think twice before entering the industry—and it makes staying in business more difficult for smaller operations without the ability to scale. In other words, it’s hard out here for a small grower—which is what we’ve been hearing for years now in the marijuana world. Even mainstream media has been hip to this trend. “From Washington to Colorado, wholesale marijuana prices have tumbled as dozens of states legalized the drug for recreational and medicinal uses, seeding a boom in marijuana production,” the Wall Street Journal reported in August. Granted, these findings did rely on data from Washington, where an early market inefficiency—there just weren’t any growers—artificially spiked the price of a gram to $20-territory, but the general gist of the article is accurate. How Long Will Wholesale Marijuana Prices Continue to Drop? At some point, the production market will become saturated. Nobody will be able to increase their output, and it will be hostile to newcomers. That is, unless someone presents an innovation of some kind that gives them a clear market advantage. What would that be? More efficient lights? Hard to get more efficient than LEDs or the sun. A better strain that breaks the market? Maybe. And when will that be? Similarly, when will prices settle into a predictable groove, in the way other agricultural consumer products have? Williams, the Denver-based consultant, isn’t sure when all this could happen, only that it will happen. Then again, marijuana hasn’t yet had some kind of market-breaking crisis, something like a widespread outbreak of the fungus phylloxera, which decimated and nearly destroyed the wine industry. The good news here is that the price drop has been passed onto consumers. According to BDS Analytics, a cannabis consumer data-crunching firm that has access to POS data from Colorado dispensaries, the average price of a gram is now hovering around $7 in Colorado—a far cry from the $40 to $50 bags from black market days. The other outstanding question—for producers, sellers and consumers alike—is whether government regulation will create new demand for off-label, black market cannabis. That’s the concern in California, where a tiny minority of the growers currently in business have signed up for licenses and the required inspections. As Tawnie Logan, the chairwoman of the California Growers Association, told the New York Times, dispensary pot in California is around $50 an eighth (for now), whereas black market weed fetches $20. Will that change the way pot is grown and sold, and will it affect prices? So far in California, the tool used to stamp out off-label growers has been law enforcement, not the free market. Because that worked so well in the past.